Happy Independence Day, How in the world are you? I am recording this on Tuesday, July 5, 2-16, and I hope you had a Happy, safe, food filled, blessed day. In the spirit of full disclosure, I actually recorded the show yesterday, but when I went back and listened to it, I thought I sounded really harsh and I never want to come across that way, so I’m back here in the camper after my morning exercise and I’m going to try again. We’ve got a lot of ground to cover today, so let’s crack on. Can you believe how far we’ve already come in our journey to ReDiscover the Bible together? We’ve flown over all four Gospels, the Book of Acts, all of Paul’s letters to Churches and also his letters to individuals. Now we’re moving into a section I call, general letters or open letters. These books are quite generic as they are written to Christians at large and were most likely sent out as round robin documents intended to go from one place to the next until they covered the empire. We’re going to cover some pretty deep and challenging topics as we flip through these letters; things like, Gnosticism, the truth of the Gospel and the truth of the Bible, Why Jesus hasn’t come back yet, the nature of angels and demons, how to handle false teachers, the human tongue and it’s tendency to get us in trouble, and of course, the End Times. Up to this point, I’ve been on pretty safe ground, with not too much controversy. But some of the things we’ll look at over the next couple months, are somewhat more challenging and have been the source of many of the divisions in Christianity. There is just no way I’m going to be able to tackle these last 9 books without ruffling some feathers. I don’t want to do that, but I absolutely know I will. All I ask is that you do your own homework. Be like the Bereans and search the scriptures daily. The book we’re going to look at today, Hebrews, is one of those challenging ones. The purpose of the letter was to establish the superiority of the New Covenant – Grace- Christianity- over the old covenant – Law- Judaism. In the first century, as Christianity was establishing itself as distinct from being just a sect of Judaism, it’s unique features created a rift between the Jewish Believers and the Gentile ones over what the relationship between the Church and Israel should be, and in how this fledgling group of Christ followers should respond to the law of Moses. While there was general agreement in terms of Jesus being seen as the Jewish Messiah and that His death extended forgiveness to the Gentiles also, the traditionalists saw the Gospel as an amendment or an addendum to the covenant with Israel through Moses, whereas the Apostles were calling this a NEW, Superior Covenant and that it was actually replacing the old one, rather than merely adding on to it. The book of Hebrews is more or less, the Magnus Opus, or the premier defense (apologetic) of the Apostolic view. The author, while not mentioned directly, is generally believed to be Paul. When we get around to studying through this book more deeply, we’ll spend some time talking about the authorship and dates; for now, just know that I believe that Paul is the source for this book. I am increasingly persuaded that rather than being a letter in the traditional sense, it was originally a sermon he preached and that it was written down by Luke. Primarily, as I’ve mentioned, Hebrews is a defense of the superiority of Christianity over Judaism, which makes this book controversial on many levels and to many groups. Let me explain why. First, there is a segment of the population who believe that all religions are essentially of equal value, or non value, as the case may be. Christianity does not allow for that opinion. We discussed this subject briefly when we looked that the Gospel of John, but it’s also very clear here in Hebrews. From a secular perspective, Christianity cannot be lumped in with other world religions. Since secularists reject all religion and primitive and irrelevant, it’s no big deal, but for the millions who consider themselves ‘spiritual’ but open minded, Hebrews is one many Bible texts that grates against current ‘politically correct’ understandings of religion. Secondly, it’s objectionable to the Jews because it overtly declares Christianity (the New Covenant) to be superior to the Mosaic one, which they could never accept as anything other than blasphemy. Thirdly, it is troublesome to the growing number of Christians who are in love with all things Jewish. We have more and more Christians who are practicing the Jewish feasts like Passover and tabernacles, have moved services to Friday Nights and refer to Jesus as Yeshua, and prefer the Hebrew description of his role as Messiah rather than the more common Christ, which comes from the Greek expression of the same word. These Gentile Hebraic leaning believers see Christianity as the fulfillment of all God’s promises, but not necessarily as a replacement covenant. And fourth, Hebrews is often problematic for 21st century dispensationalists who see the Church as a Parenthesis in God’s plan for Israel. As one friend of mine says, ‘We’re, meaning the Church, We’re the B team. God’s plan is for Israel. It’s hard for me to talk in detail about this in one episode, but we’ll return to it a few times in these last books of the New Testament. 11:41For the first nearly 1900 years of the Church, the idea of the new Covenant replacing the old was generally accepted, though there were differences in understanding of what would happen with the Jews during the end times. Eventually, those who leaned towards a ‘systematic theology’ that believed the New Testament did not replace the old, was not merely and extension of Old Testament, but an interruption to it, began to create a pattern that comingled prophesies of the Old Testament with New Testament teachings on the end times and a new theology usually called Dispensationalism was born. When Israel became a Nation in 1948, this was seen as a fulfillment of prophesy and the Dispensational movement exploded. By the mid to late 60s after the 6 day war and the popular, easy to understand, ‘right out of the headlines’ writings of Hal Lindsay and John Woolvord, dispensationalism became a juggernaut, replacing historical Premillennialism, Postmillennialism, and A millennialism as the generally accepted view. With the help of the Schofield reference Bible, Christian Television, the Left Behind novels, and I don’t know how many different movies, many, maybe even most, modern Christians don’t even know Dispensationalism is a historically recent phenomenon. The short version of Dispensationalism is that God’s first and foremost covenant is with Israel and the Church exists to preach to Gentiles and get the world ready for God to redeem Israel as a nation. In my opinion, and the opinion of many thousands of scholars, the Book of Hebrews rebuts that view. First, and I do wish we had more time to discuss it, it’s a grave mistake to conflate modern Israel with ancient Israel. The way we view modern Israel in light of Scripture will dramatically affect our understanding of End Times prophecy. In my view, the only real parallels are that they have the same name and they occupy similar (though not identical) geographical territory. Ancient Israel was a Theocratic Monarchy, built on the Old Testament laws given to Moses on Mt Sinai, circa 1447 B.C. and overseen by a king from the line of David and priests from the line of Aaron. Modern Israel is a secular parliamentary democracy, overseen by elected officials. I daresay there’s not a Jewish person on earth who can trace his or her ancestry back to any particular tribe with any certainty at all. The majority of early leaders of Modern Israel while heroic, were atheistic nationalists who referred to themselves as Zionists. They were secularists in every way as was a large part of the Israeli population. These days, Israel is a melting pot of both secular and religious Jews, along with many Hebraic Christian groups, Believers who are eager to hasten the Last Days, and a large population of Islamist along the edges who see Israel as invaders who forced them out of their homeland. I have no intention of getting into Holy Land politics, I’m merely trying to describe the population in broad terms. Most Dispensationalists are looking for fulfillment of prophesy under every stone in the middle east. They tend to believe that God wants to restore this current nation called Israel to the glory of Davidic Israel , including rebuilding the Temple and re-establishing the sacrificial system. I believe the New Testament teaches that both of those goals are in error and are actually in opposition to the Gospel. And I believe the Book of Hebrews establishes that fact once and for all. See, I told you I was going to ruffle some feathers. The book of Hebrews is in perfect harmony with the letters to the romans and to the Galatians. First of all: there was something wrong with the old covenant so God replaced it. The blood of bulls and goats could never take away sin. Jesus is a once, for all, sacrifice. Why would God want to reinstate a system that doesn’t work. 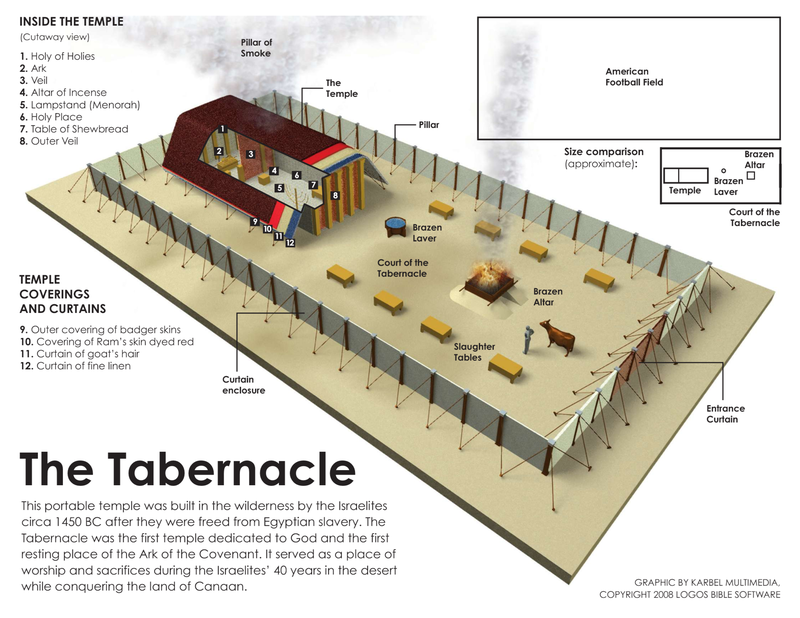 Chapter 9 reminds us that it was the Tabernacle, rather than the Temple that was authorized by God. The temple was David’s idea. God honored it because of his love for David, but the Tabernacle, a temporary structure was His plan and it will be replaced by the New Jerusalem in a New Heaven and a New Earth. Chapter 9 paints a clear picture that Jesus fulfilled the Old Covenant and replaced the formal Worship system. The veil between the Holy and Most Holy Place has been torn in two. There is no barrier between man and God. In the Holy place, the place of worship, we have a new light from the word of God, fresh bread in the Lord’s supper, Prayers that go directly to God without the need of smoke that worms its way through the veil. Outside, There is a once for all sacrifice so there is no more need for constant bloodshed and the washing is for a kingdom rather than a single tribe. We are a royal priesthood and are washed in the baptismal water, once, not before each time we enter the sanctuary. That’s a lot to chew on. It’s hard to get your head around. Do your own homework. Don’t listen to me just because it’s me. Read the book of Hebrews for youself. What conclusions do you draw? Let me know. We’re in this together. Send me an email or drop a comment in the comments section of the show notes. I’d love your thoughts. So, for now, that’s all I got. See you next time. Until then. Be blessed and be a blessing. This is exactly what me and Dee were talking about yesterday. Can’t wait to get some questions answered in our group this week! Looking forward to seeing you there, Hilary.